2️⃣CHICKEN. 🐔 Oh that little boy. It took me maaaybe six pages to fall in love. I want to just scoop him up and take him to the library and then read about sharks with him in his library basket. Just a perfect (but messily realistic) little character. 3️⃣The family-centered story. I am a sucker for these, and some are perfect (Here Today by Ann M. Martin) while others fall flat (ahem, Rules). Caterpillar Summer lands gloriously in the same category as Here Today. Gillian McDunn handled the balance perfectly in that Cat was able to enjoy a friendship without the family losing their centerpiece in the story. This is the kind of book I could have read in a day, but my schedule didn’t agree. 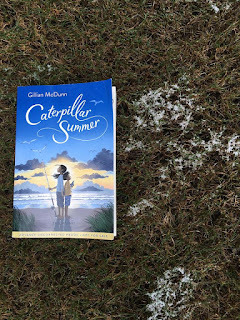 Caterpillar Summer introduces us to Cat and Chicken, two nicknamed siblings living in San Francisco with their widowed mother, and plunges us into their world with just the perfect amount of detail as plans fall apart and they find themselves spending the summer with the grandparents they never met. Cat, a serious and guarded little thing, immediately decides not to like her grandparents, who equally promptly make this nearly impossible. As the summer goes on, Cat finds herself scheming to reunite her mother with her estranged but loving parents. By the time this book releases, the weather will be warming and this is the perfect story to read during the summer or on vacation. I can’t wait for more people to get their hands on it. You will love it.